This isn’t EASY! Are you holding back on taking action trying to figure out the “best” or “perfect” way to engage with your DAF donors? You don’t need to get it right the first few times you do it. You just need to do it. Here are things we’re working on… they aren’t hard to follow. Have someone tell you how many donors on your file have EVER used a donor advised fund giving account. Compare that to how many used one to give to you in 2017. You will quickly see the overall total of donors who COULD give to you is much larger than the number who DID give to you in 2017. When you have identified all donors with a DAF gift, determine how many of them have a working email address. Being able to send them emails with the DAF Direct widget or a link to their DAF sponsor is the fastest way to get to their funds. The average range of DAF donors with an email address has been a low 15%-25% in recent audits. If I was at the organization receiving the grants, I would suggest “you can easily make a recurring grant recommendation” in every communication in every channel to all DAF donors. If you plan and implement strategies like this you will achieve your objective. Don’t waste money. DAF donors can be cultivated to higher levels of giving within a midlevel stewardship program. But how many of you use fancy proposal packages with first-class postage on your RETURN envelopes. A more suitable approach for donors whose money comes from a 3rd party charitable sponsor is to save all the return postage and create a “response requested” form suitable for inspiring their giving through their donor advised fund. You really don’t want to tell me “make your check payable” as the average DAF grant is 10x larger than the average check. Just take DAF donors into separate mailing lots with suitable messaging; sometimes removing what you are saying to regular donors can be an improvement. I understand we were all raised to include a return envelope with everything you send, but that will not get you a DAF gift in the future. There are many ways to inspire a DAF donor to willingly use their giving account over and over again – and one easy method turns out to be postcards. They are fast, inexpensive, and only have a little room for copy to inspire the donor to give (no room for anything else). 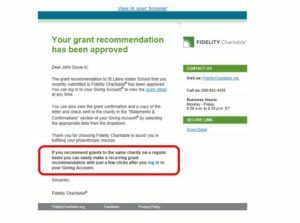 You really only need to print two versions: one for donors with a Fidelity Charitable account and one for the other large group at Schwab Charitable. ASK for BIG leadership gifts. Until you get more email addresses, what else is as inexpensive? Use your DAF acknowledgement letters to learn more about your donors. We are recurring monthly donors to a few non-profits and every month we get the exact same thank you letter as the month before. Isn’t this a great opportunity for them to ask me what I think is so special about them, or if I am on their file at another address, or do I prefer to be addressed as Jack or John, etc. Just ask me to email any answer and sometime you’ll discover my email address! After doing several DAF audits, seeing where all the money is coming from, I opened a 2nd Doyle Family Giving Account with Schwab Charitable in August. We have had one at Fidelity for several years. Now I will be able to give you the donor experience and perspective from the two largest sources of donor advised funds you will need to know about. Copyright © 2019 Amergent, Inc. All Rights Reserved.